© 2006 Aquatic Video Productions Inc. 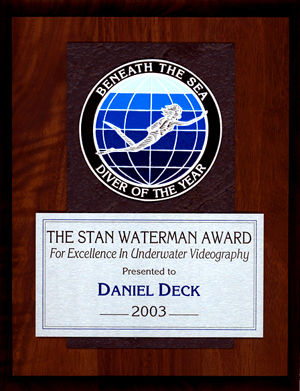 This is the coveted "Stan Waterman Award For Excellence In Underwater Videography" that was awarded in March of 2003 to Daniel Deck. This award was presented by Beneath The Sea in their 2003 Underwater Photo/Video Contest. In addidion to this award, Dan received a trip with Explorer Ventures to the Great Barrier Reef in Australia.